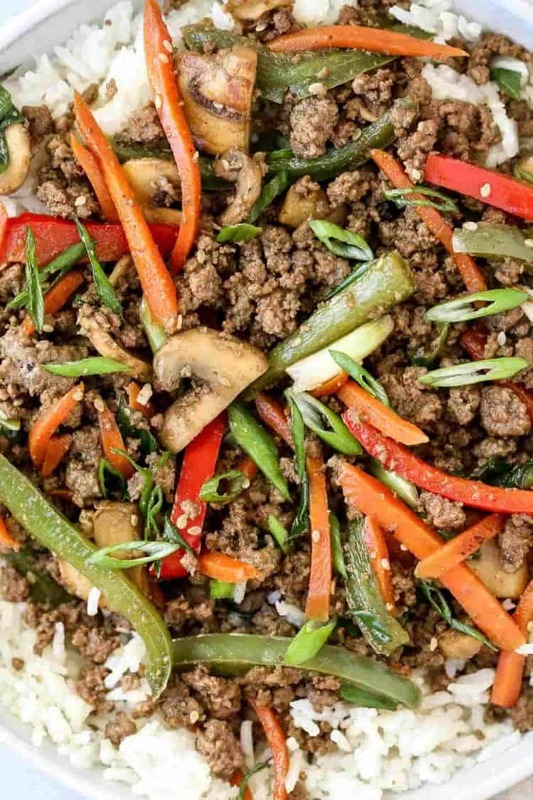 Incredibly easy Ground Beef Stir Fry Recipe. Ground beef sauteed with vegetables in a most delicious soy sauce! This quick stir fry is completely ready in under 30 minutes, perfect for busy dinners. This recipe reminds me of our Chicken Fried Rice – it’s totally better than takeout! We love how quick it is to prepare this beef stir fry. This stir fry (and our Baked Chicken Thighs recipe) is always in rotation in our home. I’m excited to be having my friend, Natalya of Mom’s Dish sharing her beef stir fry recipe on our site. 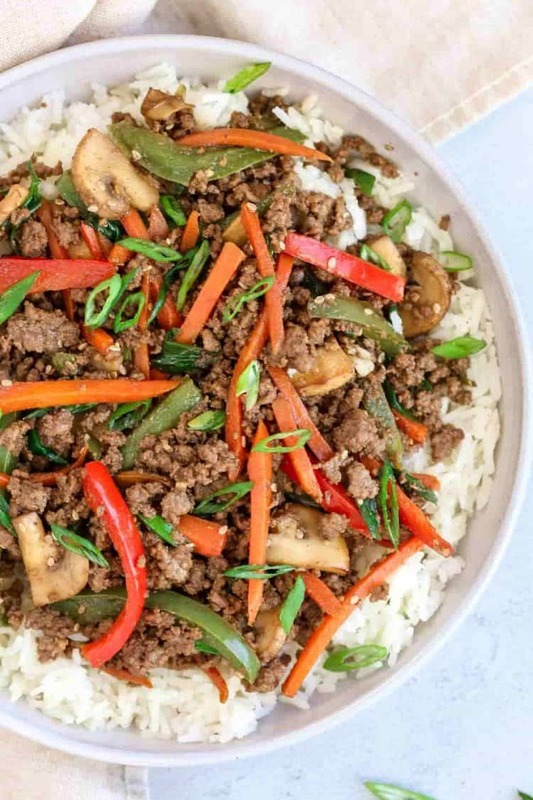 Ground beef stir fry is a very quick one pan dish that will become your favorite when craving something Japanese. 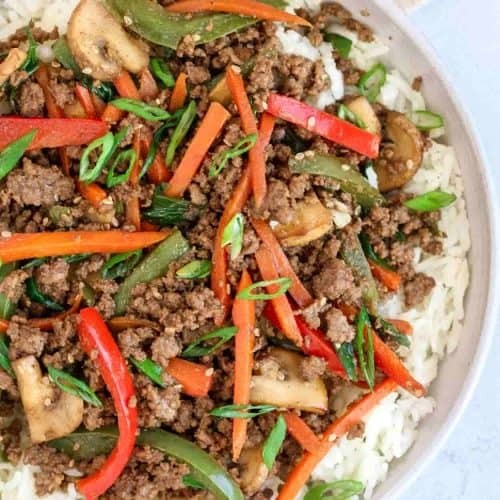 Ground beef cooked with peppers, mushrooms and carrots and flavorful sesame sauce is a treat to be had. The ingredients come together and create a mouthwatering dinner! Stir fry is a dish the whole family enjoys, even the picky eaters. Like the Yakisoba Noodles – kids go crazy for this dish! how to make stir fry? Stir fry has to be one of the easiest dinner ideas! By the time the oven baked rice is cooked to serve with the stir fry, the stir fry is completely ready. Cook ground beef until browned, remove from skillet. Cook the bell peppers, mushrooms, carrots and garlic until tender. Add beef back to the skillet and pour sauce over all the ingredients. Cook for a few more minutes and serve with rice or quinoa. TIP: You want to use lean ground beef for this dish. I would recommend anything over 90%. You can always switch out the veggies to your personal preference. This will always taste delicious regardless of the veggies you use. Other vegetables that will work with this stir fry would are broccoli, green snap peas or zucchini. can I reheat stir fry? Yes, the beef stir fry reheats great the next day, which makes it perfect for meal planning or work lunches. To reheat stir fry, add to a skillet and cook over medium heat until reheated. If dry, drizzle some added oil. Chicken Stir Fry – Chicken stir fry with pasta. Easy Korean Spicy Noodles– With the perfect kick. Baked Chicken Thighs– Tender and juicy fall-apart chicken thighs. Quick and easy Ground Beef Stir Fry Recipe. 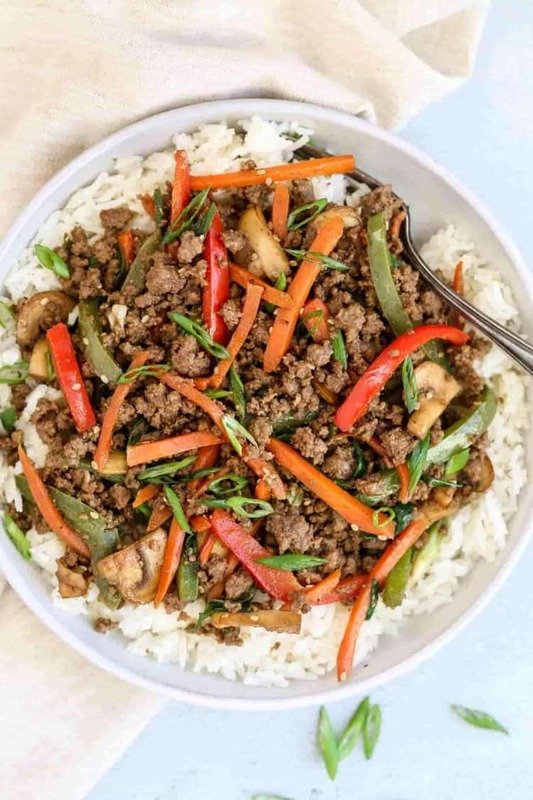 Ground beef sauteed with vegetables in a delicious soy sauce with sesame oil! The stir fry is completely ready in 30 minutes. Perfect for busy dinners. Pre-cut all vegetables for the ground beef stir fry. Cut the peppers and carrots into thin strands. Slice the mushrooms. Finely cut the green onion. Combine all of the ingredients for the sauce, set aside. Heat 1 Tbsp oil in a large skillet. Cook ground beef in the skillet, breaking up the meat as it's cooked. Remove meat from skillet, set aside and cover. Using the same skillet, add the mushrooms, carrots and peppers with additional 2 Tbsp oil. Cook until vegetables are tender. Add ground beef back to the vegetables. Pour sauce over and mix well. Cook an additional 3 minutes and remove from the heat. Valentina, its an honor to work with you. I am so happy that your people will get to try the recipe. I love your rice suggestion. Thanks again! You’re so sweet, friend. I can’t wait for everyone to try this amazing stir fry recipe.